Bedtime Stories Mama Say What?! | Mama Say What?! Bedtime is my absolute favorite time of the day with my daughter. I may be tired, and even a little grumpy, but knowing that it’s a special time for both of us that only we share (and that after which I know I’ll be getting hours of free time), makes it something to look forward to every day. 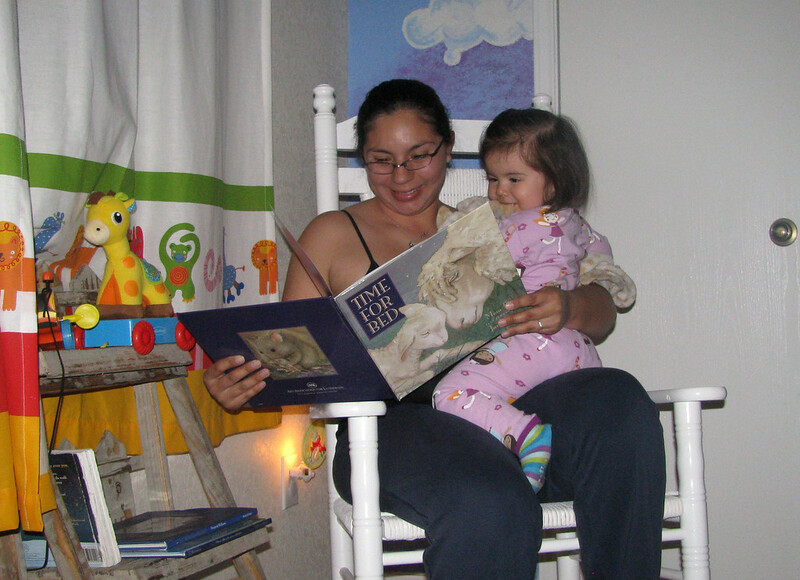 We snuggle up in our rocking chair, in dim “sleepy mood lighting,” read a story (sometimes two) and say good night to each other. We have about five books that we’ve designated “bedtime” books, and for some reason they’re all blue. That wasn’t intentional, I just find them nice, calming stories. The Velveteen Rabbit by Margery Williams, has always been a favorite of mine. We have yet to actually read it in it’s entirety. At this age, we flip through the pages, pointing out the pictures while I paraphrase the story for her. I look forward to the day when she can appreciate it as a whole. Time for Bed by Mem Fox, is a cute book that was given to A by my mother-in-law. It rhymes, which I always love in children’s books, and it has baby and mama animals which is great for me to not only teach her big and small, but also to teach her the different names that baby animals have. Wherever You Are, My Love Will Find You by Nancy Tillman, is a precious story about a parent’s love for their child. Its illustrations are whimsical scenes of a young boy playing with exotic animals. On the Night You Were Born by Nancy Tillman, is the story of the birth of a special and unique child, which all of our children are. 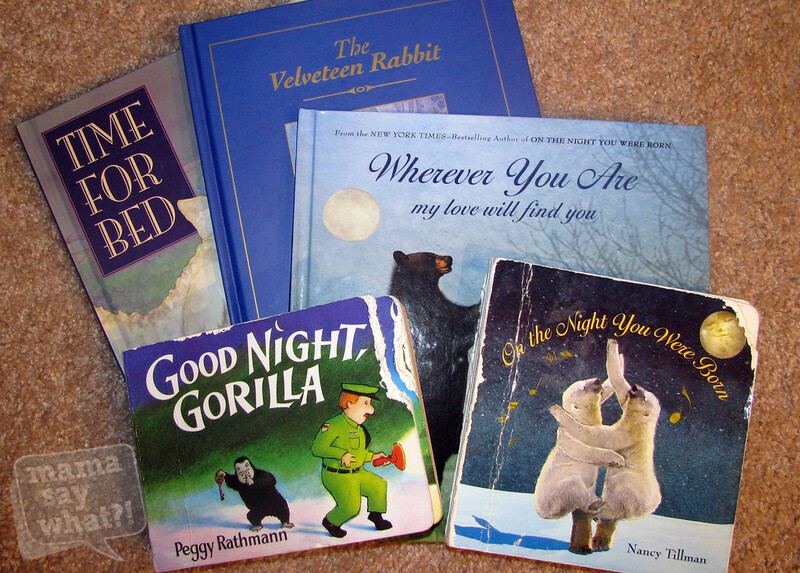 Goodnight Gorilla by Peggy Wrathmann, is a cute story of few words. I like to elaborate with my own descriptions of what I see in the illustrations, and hope as she talks more she can do the same. I change the story a little every time. Her favorite page is the one that is completely black filled with speech bubbles saying good night which I read in different tones. And she loves to find the banana and balloon! Added by Guest Mama on March 19, 2013. Pingback: TJ's Favorite Children's Books - Age 3 Mama Say What?! | Mama Say What?! Pingback: C's Favorite Children's Books- Age 19 Months Mama Say What?! | Mama Say What?! Pingback: Maggie D's Favorite Children's Books - Age 17 Months Mama Say What?! | Mama Say What?! Pingback: N's Favorite Books - Age 3 1/2 Mama Say What?! | Mama Say What? !